Grandma Becky. | Scuffalong: Genealogy. Grandma Becky. – Scuffalong: Genealogy. She was a little, brown-skinned woman, had beautiful hair. She was short. Even shorter than I am. Tiny. And she used to keep us when Papa and Mama would go away, maybe for the day or overnight. She’d always come down and keep us. And, boy, we’d have a ball, ‘cause she’d let us do anything. Our mother used to have a closet full of canned goods, you know. Blackberries and dewberries and apples and all kinds of stuff. And, honey, Grandma Becky would let us go in there and eat up a whole jar of peaches. She just let us do anything. We were crazy about her. Rebecca Parks Colvert was born about 1839, probably in Iredell County NC. Her death certificate reports her parents as Jerry and Lettie Gray — probably the Jerry and Lett listed in the 1827 inventory of John A. Colvert’s estate. Becky was about 14 when she married Walker Colvert, and the couple probably lived apart until Emancipation. The 1860 slave schedule of Iredell lists ten slaves belonging to Walker’s owner W.I. Colvert, but none appear to be Becky or her children. (Was she owned by a Parks, one of John A. Colvert’s kin?) She reared Walker’s son John, and her own children Elvira and Lovina and Lewis, and then Walker’s grandson Lon. After her husband’s death in 1905, she left their farm north of town in Union Grove township and moved into Statesville. Becky Colvert died 26 May 1915 at the Harrison Street home of her stepson John W. Colvert. She was about 76 years old. Interview with Margaret C. Allen by Lisa Y. Henderson; all rights reserved. Pingback: She is now with child. | Scuffalong: Genealogy. 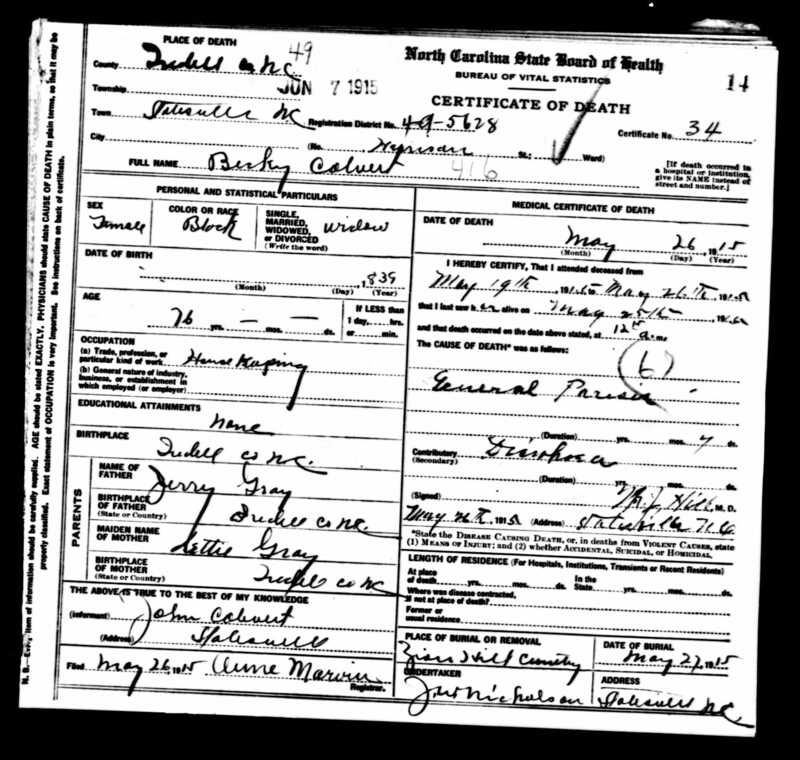 Pingback: North Carolina death certificates: COLVERT. | Scuffalong: Genealogy. Pingback: Elvira. | Scuffalong: Genealogy.